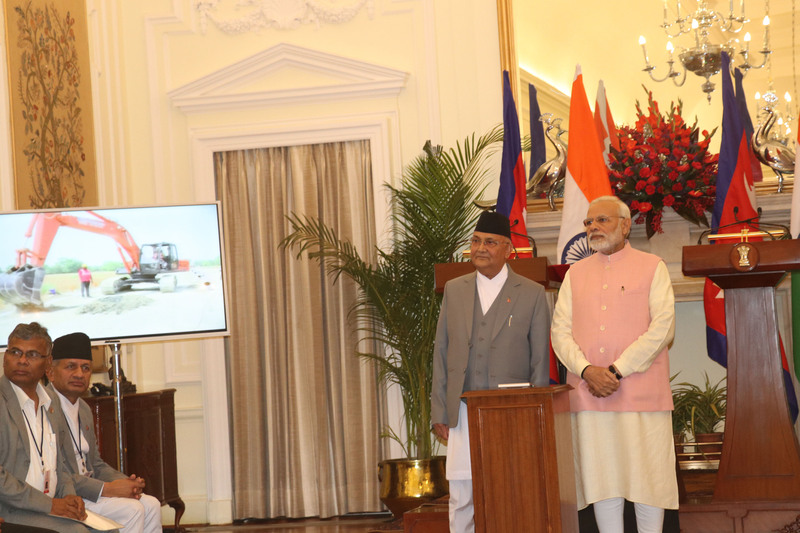 PM Oli and his Indian counterpart Modi lay foundation of petroleum pipeline project - Integration Through Media ....! Ramesh Lamsal, NEW DELHI: Prime Minister KP Sharma Oli and his Indian counterpart Narendra Modi on Saturday jointly laid the foundation stone for the construction of a petroleum pipeline. PM Oli is currently on a three-day state visit to India. The foundation laying took place at a special ceremony held at the Hyderabad House. The task of laying the pipeline is underway on the Amlekhgunj-Raxaul-Motihari sector since the second week of March. So far about three kilometres of pipeline has been installed. Engineer of the Motihari-Amlekhgunj Petroleum Pipeline Project, Sharad Prasad Poudyal, said that the laying of the pipeline had begun on March 9. The Likhit Infrastructure, a construction company based in Maharashtra, India has got the contract for laying down and welding the pipeline. The 69-kilometres-long pipeline is taken as a project of strategic importance. Similarly, works on upgrading four petroleum storage tanks of Nepal Oil Corporation is taking place at Amlekhgunj. The Motiprabha Infratech of Faridabad, India is undertaking the fuel tank upgrading works. The Government of India is putting in the entire investment through the Indian Oil Corporation for the pipeline project except distributing the compensation for the land acquired for laying the pipeline at some places in Birgunj, which will be undertaken by Nepal Oil Corporation. The cost of the pipeline is approximately 50 million Indian rupees per kilometre. The pipeline would be 32.7 kilometres from Motihari to Raxaul and 26.2 kilometres from Raxaul to Birgunj. More than 31 kilometres of the pipeline to be laid in Nepal has already entered. Black steel pipe has been used in the pipeline. This pipe has been produced by Seamless Limited of Maharashtra State, India. The construction of the pipeline is expected to reduce the long queue of fuel trucks at the Birgunj customs zone at the transit point and ease the supply of petrol to Nepal. This would also reduce the logjam of petrol tankers on the Birgunj-Pathlaiya-Amlekhgunj road section. The then Minister for Supplies of Nepal, Sunil Thapa and Minister of State for Petroleum and Natural Gas of India Dharmendra Pradhan had reached an agreement to this effect. It is expected that with the operation of the pipeline, the petroleum products’ supply will be easier as over 50 percent consumption of such products in Nepal is imported from the Birjung border point. During the foundation laying programme Supplies Minister Matrika Yadav and his counterpart Dharmendra Pradhan and other Nepalese delegates were present. Though the both sides had expected to complete the project within 2017, it delayed due to policy hurdles in both stake parties NOC and IOC. Now, it is expected that the project will be completed in three years. The required pipes and other equipments to be used in the project will be kept in Birgunj based sugar factory building. The NOC has further aimed at importing 200,000 liters fuel per hour from India into Amlekhgunj depot. The pipeline will further be extended to Chitwan in future.